you can't find the right hat. 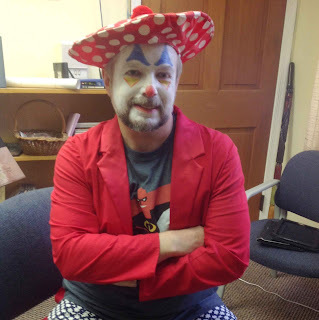 I started Christian clowning years ago when asked if I would perform for a Vacation Bible School session. I am an outgoing person. I enjoy performing for others. I really enjoy presenting a positive message of faith and joy to people. So, I agreed to give it a shot. Library research came next and I was impressed by the long, colorful, and meaningful history of the clown. Did you know that the fool, the court jester of the Middle Ages, the clown walking on the knife's edge, was the only person who could tell a king his plan stinks ... and would be listened to if skillful enough. So, I became Joyful Noise, one very amateur but enthusiastic Christian clown. I have performed sporadically over the years. In recent years I have begun to question whether to continue. I've reached a point where when only the white face is applied and I smile the laugh lines so highlighted look a little terrifying. I question my judgement as a middle aged pastor about continuing to carry on in this way. Then I hit the boards, see kids and adults light up with smiles and laughter and I'm hooked all over again. A clown, Christian or otherwise, has a grand total of about ten seconds when the face paint and costume will give the clown a little grace. 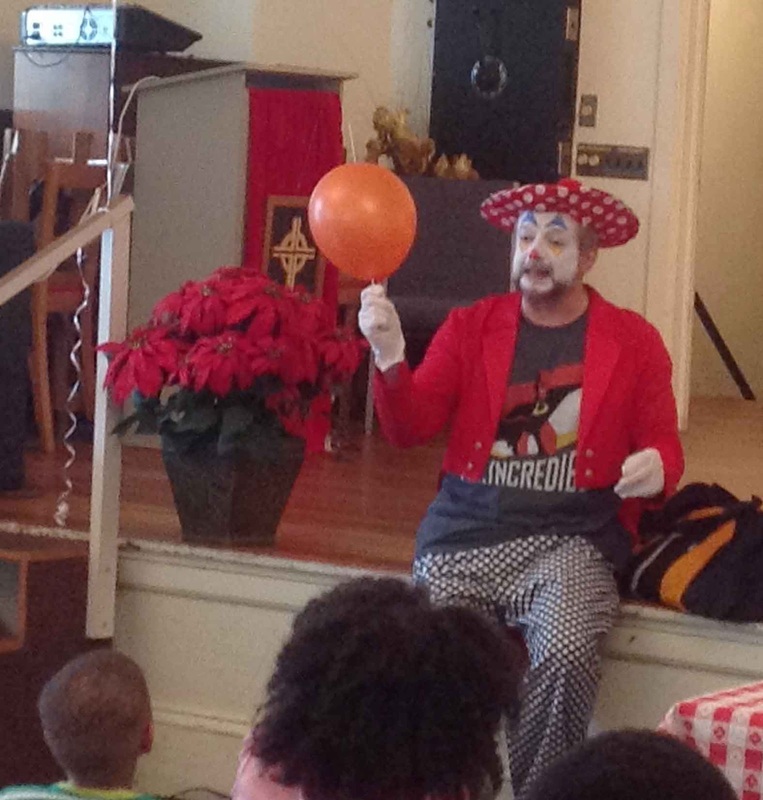 After that, the clown needs to make sure to present an appealing invitation to play to the audience ... or leave. Skits come quickly, one after the other, with the clown keeping true to the character developed and, in the case of Christian clowning, to love for God and neighbors (especially those neighbors in the room at that moment). Why the colorful face? Excellent question: it is symbolic. 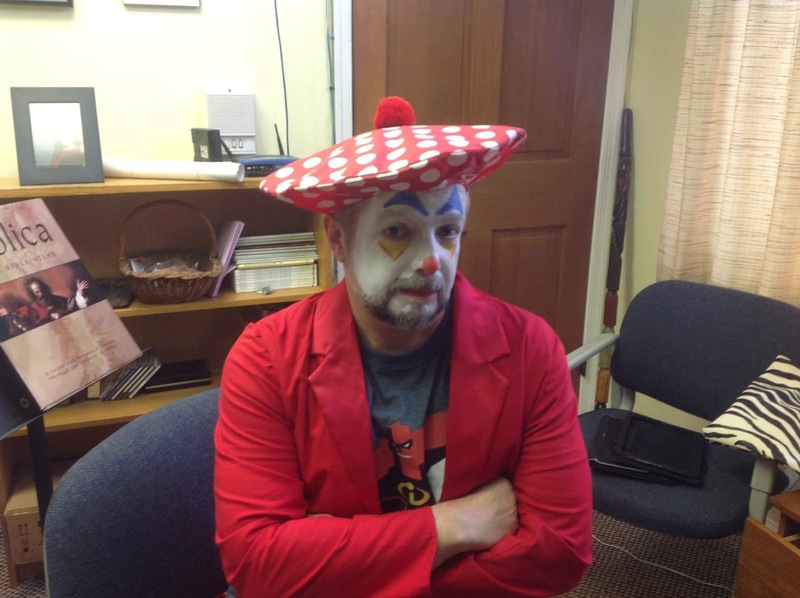 For the Christian clown, the white covering most of the face is symbolic of death (ew, right?)! The colors added represent laughter (inspired by faith in God and God's promises to us) in the face of death. It's powerful, really. One pastor who clowns far more regularly than I do states that often people in hospitals will give up concerns to his clown that they would never share with their pastor. It's true. That is the power of the clown, when the clown is well done, open, and friendly. Clowns allow us to recognize our own humanity. Clowns allow us to admit how often we make mistakes, how often we fall down, and they show us that, yes indeed, we can get back up and try, try again. Clowns also allow us to present truths in a wonderful way that is creative, memorable, and fun. It really is an invitation to play that leads to some pretty wonderful and blessed interactions both in churches, hospitals, out in the community, and elsewhere. It's a great responsibility as well. 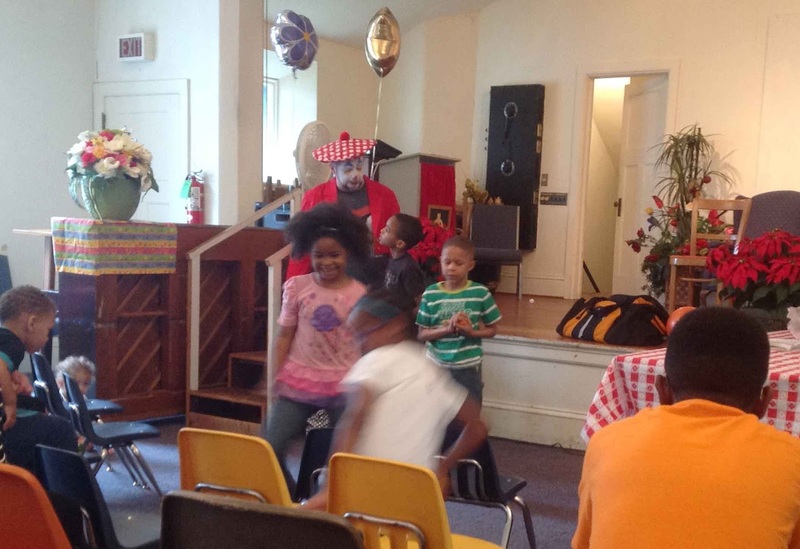 One of the most wonderful things about clowning is getting to learn from your audience. The other day I had children learning to practice juggling with me (a little playful practice at discipline) using a single wiffle ball tossed from hand to hand. At the end of that little time together I gave each child one of those balls as a little reminder of our time together. One child came up to me and solemnly shook his head. He handed the ball back to me and said seriously, "It would only get broken at home." Each child quietly nodded and returned those balls to me. To me, those were simply really inexpensive tokens to use once and give away. To those children, they meant far more. It's hard to continue when so moved. You can't dab your eyes wearing that face paint, ya know. So, for now, I'll continue to use the costume and put on the face paint. I'll go on being Joyful Noise and making one as well, as long as God wants me to do so. Who wants to join me? I am growing increasingly disturbed with hateful "memes" abounding on social media of all sorts. So many of those pithy pictures and quotes are designed to divide people. A great many memes essentially say, if you do not agree with me, you are subhuman. Making people into subhuman "others" is the first step toward violence against them. Before sending another hateful meme, we should all pause and ask ourselves, "Who do I know who is being unfairly tarred by the gross generalization here?" 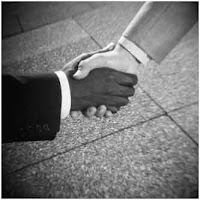 Ask, "Does this stand with or violate the two great commandments to love God and neighbor (everyone)?" Let's all do what we can to stem the tide of divisive hatred leading to violence.